This poster contains images and useful information about the causes, affects, and possible treatments for strokes. 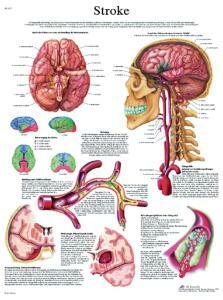 In this chart the anatomy of the brain is detailed along with information on vascular occlusions and hemorrhages. The colorful images help to clearly explain a stroke.